Arms. 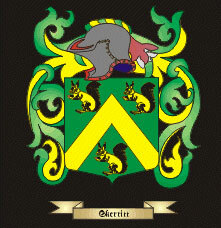 Vert, a chevron, or, between two squirrels, counter sejant, in chief, and one in base, proper. Crest. A squirrel, sejant, proper. Motto. Primus ultimusque in acie. The Skerritt family have been noted in the county since 1242, and were a well established member of the Tribes of Galway. They had seats at Ballinduff, Drungriffin, and Nutgrove, as well as properties in County Clare. This old family is of considerable antiquity in Galway. The name was originally Huscared; and they derive their origin from an English family, one of whom, Roger Huscared, is mentioned by Dugdale, as a judge, at a very early period. Robert Huscared, or Scared, held lands in Connaught, under Richard de Burgo, in 1242. In the registry of the monastery of Athenry, Walter Huscared and Johanna his wife, are mentioned amongst the principal benefactors of that foundation. Richard Scared or Skeret, who is supposed to have been their son, was Provost of Galway, in 1378. To him belonged, the estate of Ardfry, in Mearuidhe, and other lands about Clare-yn-dowl, now Claregalway to the friars minors; of which convent, he bestowed a piece of ground, on which, part of their monastery was built. Some of these lands are held by his descendants to this day. The principal branches of this name, at present, are those of Ballinduff, Carnacrow, Drumgriflin and Nutgrove in County Galway and Finvarra and Funchien in County Clare.